“May I come back to our discussion of last night before you will tell us more about organized chaos and the mind of the warrior?”, asks Man to Carla. “All right, it’s better to finish a topic before starting a new subject”, says Carla. “When a monk passes and he is addressed with “Hey, you”, then right away this monk will turn his head towards the caller. When this monk hesitates upon the second question “Who are you?”, then this monk has an active consciousness, boundless and unclear without foundation to rely on”. One call and one turns her/his head –Do you know the self/Self or not? Vaguely, like the moon  through ivy, a crescent at that. Upon reading this question and verse, I thought of our last discussion about God as “another, a stranger”, who is separated from “the Unspeakable”, ” the Supreme Astonishment”, “the ultimate question that exceeds words”. Before the separation  were God, the people and everything around us in this fundamental affliction of ignorance, as a healthy human body without ailments also forms a coherent entity without separate parts? Had they a foundation to rely upon and what foundation was it, or was the lack of a foundation the source of an active consciousness, boundless and unclear? I don’t know the answer to these questions. And – after the fall, after the separation – wherefrom arrives the boundless road of destitution with many sorrows? Heschel continues his essay “Man is not alone”  with the topics: “faith”, “one God”, “beyond faith”, “strive for oneness”, and “common actions are adventures”. Would Heschel have seen “One call” and “One turns her/his head” in the category “common actions are adventures”? I think so; but would he finally have seen “One call” and “One turns her/his head” as “one” or as “separate”? I see it vaguely as a crescent Moon through ivy”, says Man. “At the strophe “boundless and vague without foundation to rely upon” from the Buddhist question, I was reminded of “śūnya” – meaning “empty” – from the Heart Sūtra  in which “form is emptiness as emptiness is equal to form”; in emptiness is no Dharma – or world order or duty. Now I invite you to visit the Cappelle Medicee  in the Basilica of San Lorenzo . 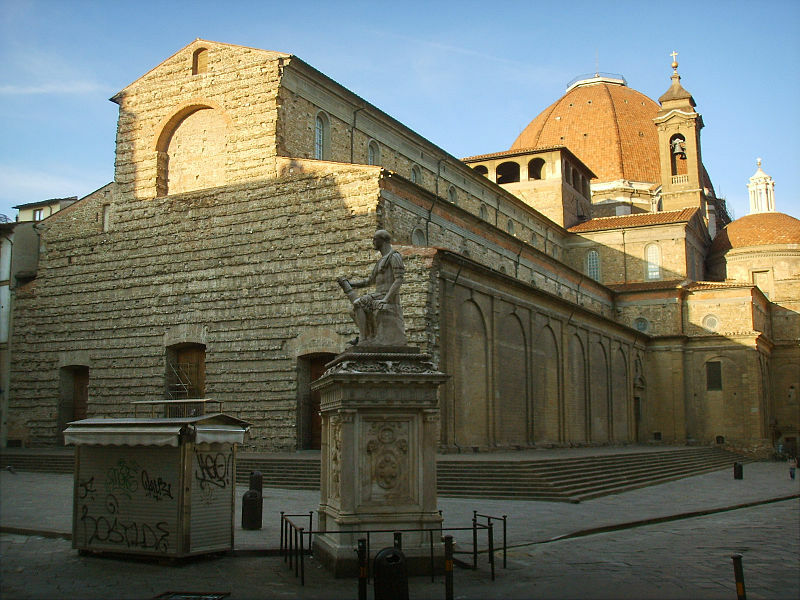 This Chapel – located behind the Basilica – is a symbolic mausoleum of the family De Medici. This family was a “child of riches in the Renaissance that has known many sorrows once it had fallen on the boundless road of destitutions“. In my opinion the mausoleum superbly shows the immensity of the sorrows and the coldness of the destitution of this family”, says Narrator. Carla, Man and Narrator visit the Cappelle Medicee. They continue their discussion outside seated on a bench in the Piazza di Madonna degli Aldobrandini. “Everything in the Cappelle Medicee aims to create distance to the spectator. I expect that in the past visits to this mausoleum were only allowed on invitation by the family. 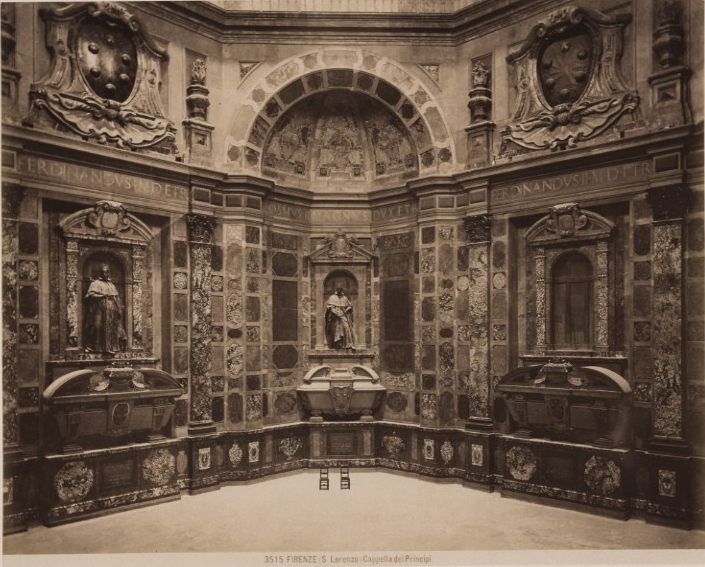 I think this mausoleum sought to remind the descendants of the Medici wherefrom they owed their wealth and to show visitors which “children of wealth” were commemorated here. At each grave in the mausoleum, I wondered “Who are you?” and “Do you know the self/self or not?”. I think “Vaguely, like the moon through the ivy”, but the abundance of the many types of “Ivy” will not be helpful to see the Moon”, says Man. 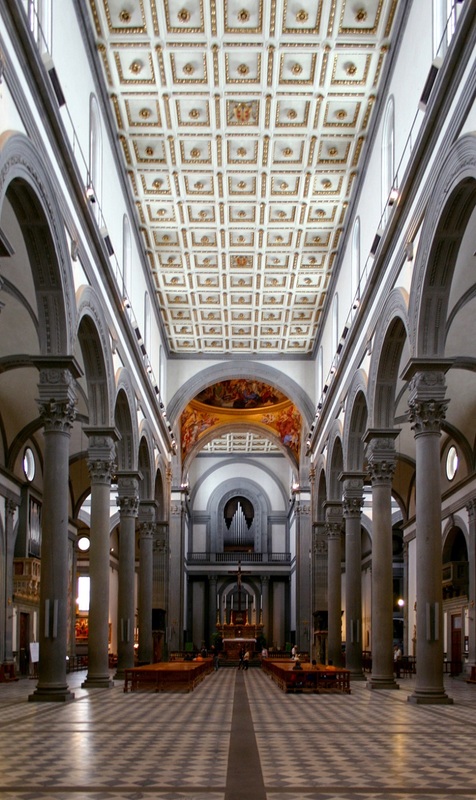 “May we visit the Basilica of San Lorenzo now? This building is austere outside, but the Basilica will show its beauty inside”, says Narrator. “I am pleased that we have continued the discussion, as this – and certainly the visit to the Basilica – creates a nice stepping stone to the separation between science and religion in the Renaissance. 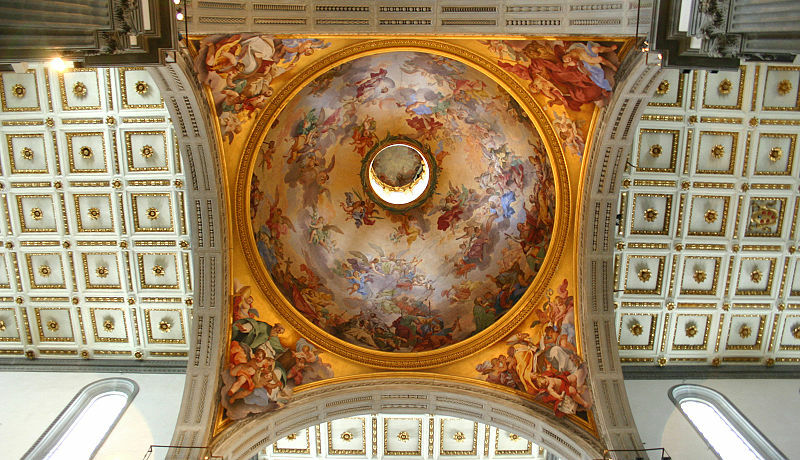 The transition in style of the choir dome toward the ceiling of the main and side aisles nicely showed the wish to change science – emerged from the Medieval Scholasticism – toward an orderly science that explains everything in case we know and apply the basics. May I continue on this subject the next time, because now I need to rest?”, says Carla. 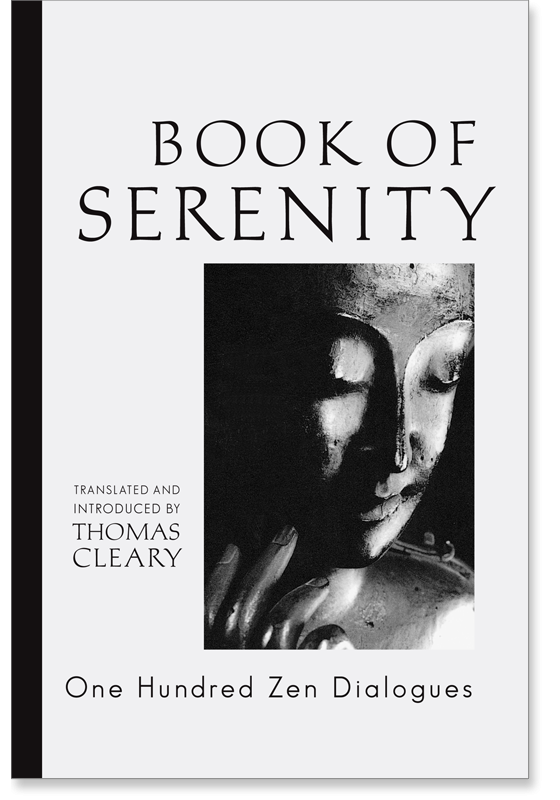 Free rendering of a part of the Zen dialogue “Guishan’s Active Consiousness” from: Cleary, Thomas, Book of Serenity – One Hundred Zen Dialogues. Bosten: Shambhala, 1998 p. 163 – 166. See also: The parable of Adam en Eve expelled from paradise after the fall in Chapter 3 of Genesis in the Old Testament. See: Heschel, Abraham Joshua, Man is not alone – A Philosophy of Religion. New York: Farrar, Straus and Giroux, 1951. See also: http://nl.wikipedia.org/wiki/Abraham_Joshua_Heschel. In “The Long Discourses of the Buddha. Massachusetts: Wisdom Publications, 1995 p. 38-39”, 32 abodes are mentioned for sentient beings; including 22 abodes for Gods. Are Gods also “children of riches” within this frame of mind? This entry was posted in Five, Five - Facts and Logic and tagged Abraham Joshua Heschel, Adam and Eve, Basilica of San Lorenzo, Bhuddha's, Buddhist question, Carla Drift, de Medici, Dharma, emptiness, Fall, god, Guishan’s Active Consiousness, Heart Sutra, Man Leben, Mausoleum, medieval scholasticism, Science, sentient beings, Thomas Cleary, śūnya on 8 August 2013 by Jan van Origo. Your Narrator has asked the second main character why he is studying Sanskrit. His answer is that it has happened naturally. In examining Buddhist texts he has noticed that a number of concepts are easy to follow in Sanskrit. For example the sound “âtman” is similar to our word “breath”. It also turns out that some writers on Buddhism , philosophy  and the origins of words  have studied Sanskrit. The second main character is interested in the origins of our language as a form of archaeology to the origin of our consciousness or “man-child”. At the start of the study it appeared that for lay people the origin of the Indo-European is not easy accessible: there are only a few standard studies available . On the other hand, Sanskrit – one of our older sister languages – is already in a very early stage extensively documented and fixed. This fact has caused that Sanskrit first became an artificial language and later a dead language. On the other hand, by the artificiality Sanskrit received a high status. The comprehensive, logical and sophisticated grammar is documented by Pāṇini  and his contemporaries in the fourth century BC. Our alphabet has an incoherent order; the alphabet in Sanskrit is logically built up according to the way people express vowels and consonants from the inside out. There are also very comprehensive dictionaries Sanskrit – English available. An introduction to Sanskrit  can be studied with some perseverance. Sanskrit has provided a good opportunity for the second main character to study the origin of language and thus the interpretation/expression of our consciousness. During the study of Sanskrit, the second main character has noticed that many names and places in Indian and Buddhist texts have a meaning. For example, Buddha  means “placing a bud of a flower” and Ānanda means “bliss and joy”. The Buddhist words and concepts get a larger depth with knowledge of Sanskrit. 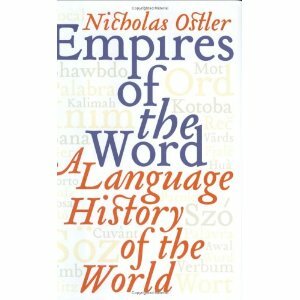 During his recovery period, the second main character has read the book “Empires of the Word – A Language History of the World “. In Chapter 5 of this book, Sanskrit is addressed under the heading “Charming like a Creeper – the cultured Career of Sanskrit”. With surprise and recognition, the second main character has read how Sanskrit established itself in India and how it is spread with Buddhism across Southeast Asia, Tibet, China and Japan by trading caravans and via freight boats. In addition to the Chinese characters, the Japanese alphabet is modelled according to the alphabet in Sanskrit. A professor has said to the second main character that a language is the speech impediment of the ruler. Sanskrit is distributed in a large area in a relative nonviolent manner. By the religions that are linked to the Sanskrit – Hinduism and Buddhism – this language has had a great influence in this area. The easiness and naturalness of this spread has surprised Nicholas Ostler : he has discussed this fact with several friends from India. These friends have pointed out to Nicholas Ostler how little believers must give up for Buddhism and Hinduism: old religions do not have to be rejected. Other beliefs require far more from its believers. The second main character does not agree with these friends. By their nature, Hinduism and Mahāyāna Buddhism  require everything from its believers including their original religions. Over time, Sanskrit is first expelled by Islam from parts of India and Indonesia and afterwards it is banished from China with Buddhism. But, the remains of Sanskrit – like Hebrew – can be seen everywhere for a specialist. Also many words in German, English and Dutch have a richer meaning with knowledge of Sanskrit. During his recovery period, once the second main character strolled around. He overheard a small group of women talk to each other twittering like birds. When he walked along, one of the women said: “What that concerns , I say so, I say nothing”. Then the women continued their conversation. The second main character thought: “Tathāgata , evam , śūnya ” or “what the world of forms concerns, thus, void”. These three words summarize in one sentence the following stage during our Odyssey with the addition: “What comes from the power of the wind in the end becomes brooken and crumbled . “Life is like a flower. It only grows on the vine. Handful of thorns and you know you missed it. And you lose it when you call it Mine, Mine, Mine”. “man” means in Sanskrit “think/consider/observe”. Mahāyāna literally means “big vessel”. All and everyone is present in this big vessel, no particle is excluded. See also: http://en.wikipedia.org/wiki/Tath%C4%81gata. The word “tathāgata” consist of “tathā” meaning “thus” and “gata” or “āgata” meaning going or coming. In Mahāyāna Buddhism the word “tathāgata” has two meanings: on the one hand “the complete arising and vanishing Self” or “Buddha or Self” and on the other hand “the myriad forms as they are”. In Sanskrit “śūnya” means zero of void. The word “śūnya” consists of “śūna” meaning “swollen state of empty” and “ya” meaning “mover, traveller or wind”. Source: Wick, Gerry Shishin, The Book of Equanimity – Illuminating Classic Zen Koans. Somerville MA: Wisdom Publications, 2005 p. 51 casus 16. This entry was posted in Five, General, Introduction, Three and tagged Atman, bud, buddha, buddhism, China, evam, Flower, Hinduism, Japan, life, Mahâyâna, man, meaning, Neil Young, Odyssey, philosophy, Pāṇini, Religion, Sanskrit, stages, Tathāgata, void, śūnya, Ānanda on 12 September 2011 by Jan van Origo.